Howdy y'all! I'm back and I will be posting daily as before until the next crisis! 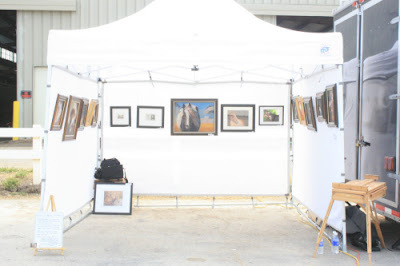 As requested, above is an example of my simple booth set up for outdoor shows. I should mention that this is only my second year of doing shows, so I'm still tweaking it. But, I've quickly figured out what is and isn't useful. My booth set up now is an EZ Up Tent (you can find one at your local BJ's or Sam's Club) and mesh walls by Flourish - I love these stinkin' mesh walls! Previously, I was using Gridwall draped with black fabric (which I still use for indoor shows - though I really would like to have propanels) and those suckers were heavy, huge, and had to be hauled on top of my car. I can fit my mesh walls in their bag and my tent in my car, which means I don't care if it rains and I don't have to unload it straightaway after a long day at a show. Also, the whole set up goes up in about 30 minutes, including hanging the art. I'd love to hear from any other artists - what works and what doesn't work for you. I package my sold artwork in the same custom 16 x 20 x 1 inch boxes I pack them in the car with, eliminating bags, tape, and breakage. The only thing I'm missing dearly is a giant banner that says something like MAGGIE STIEFVATER- PORTRAITS WITH CHARACTER - FUTURE QUEEN OF AMERICA to hang on the front of my tent. Looks like the perfect set up for you. I have the banner but no tent, ha! I got it to use at the show in NM at the gallery outside. It is double sided, so can put it from a signpost to the fence of the gallery and be seen from both directions. I used it here at a restaurant as well while I was there. 1) Is it easy for people to view your art on the white background? How is the brightness on a sunny day - does it glare? Does your booth have a top? 2) Where do you get your custom 16x20x1 boxes? I am boring my artist group to death with booth input. E-mail me with questions if you like about the price of tea in China, or anything else about art fairs. Just be glad I decided not to blog my art fair summer. But, I will be inserting an occasional snippet on my regular blog. Looks like you have a cargo trailer, but with roll-up walls and an EZ UP, you could fit it all in a Subaru. Whud up wit dat, sistah? Karen - answers! 1) not bad at all. It's mesh so it doesn't really cause glare (except when I had my camera set wrong for poor lighting as I did in that shot). The day I took that shot was very bright and to boot I was on concrete - but really the art looked great in person. My booth has a top - when it's cloudy, it really ought to have track lights like I use indoors. 2) I can't remember the name of the lady who did it but she sold all sizes of boxes on eBay and I asked her if she'd do some custom for me. I got 50 for about $1.50 or $2 each. Casey - easy answer. That's the filmographer's trailer next to me - we were all set up in the same place. It was an awful show, by the way! And please feel free to dispense words of wisdom here or on your blog. Like where to find cheap used propanels! Belinda, I'll find a photo of an s hook, but really, it's just a little metal S where one end hooks in the mesh and the other end hooks on the wire of the frame. The thing about Pro Panels is that they are hard to ship. I get mine on a slow truck from Texas - I think the driver has to stick his feet out of the bottom of the truck and run like the Flinstones. And it costs for that! Remember to get the right ones. The Knock Downs are handy for the guy that may fly or ship or wants real light weight. The big ones are super light, though. I realized that I didn't like my 6' ones and cut some extra feet to make them like the standard 7' everyone else uses. It was a good move.